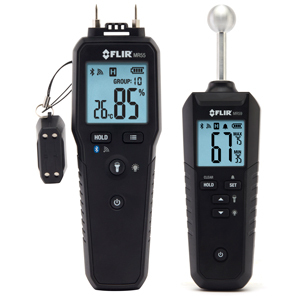 The new FLIR MR55 Pin Moisture Meter (left in photo) and FLIR MR59 Ball Probe Moisture Meter (right in photo) are accurate, professional, easy-to-use inspection tools for reading moisture measurements from a mobile device. The MR59 is a pinless moisture meter, unique for its ball probe sensor, which helps users cover larger areas in a shorter time. The ball probe makes it easy to measure in corners, over uneven surfaces, and around baseboards without leaving marks. The MR55 is a pin meter with a built-in library of 11 material groups: wood, drywall, concrete, brick, and other building materials. The user can tune the meter to the most appropriate test material to improve measurement accuracy. Professionals can also access a material group reference document from FLIR.com by using a smartphone device to scan a QR code on the back of the meter.